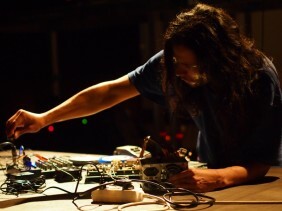 Peruvian non-musician very active in the South American experimental scene since 1995. Founder member of the independent label and association Aloardi and of bands like DiosMeHaViolado (soloist project sometimes in collaboration with Claudia Machuca, Fabian Escalante, Yuri Gutierrez and Aldo Castillejos), Evamuss (as soloist), Azucena Kantrix (with Wilder Gonzales),Tica (with Fabiola Vasquez), Garrapata (with Gabriel Castillo and Rolando Apolo), Ninguna Ninfula (with Sabrina Melenotte), Miasma (with Sergio Sanchez), 50 Otages (with Mathiu Finisterre, Bernard Bruit and Julien Otavi) and others. He explorates the broken electrical appliances, homemade audiovisual instruments, controlled induction of errors in software, programming generative tools and transducing imperceptible physical phenomena for humans to an audible dimension. He is mostly interested in the exploration of the aforementioned interfaces and auto-regulated systems to apply them to create inmersive sound experiences hacking the human perception of space-time as a form of civil disobedience and social auto-reorganization. Today he lives between France and Netherlands. He continues developing his independent projects, researches and studies in the Institute of Sonology of the Royal Conservatoire and in the “Stichting Centrum” – VillaKabila at Den Haag. 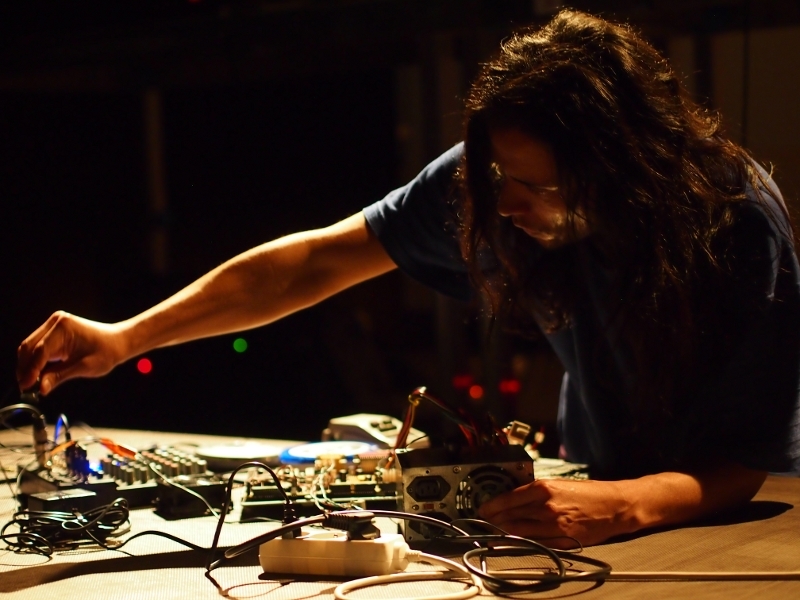 His work has taken him to make concerts, installations, performances, lectures and workshops in Latin America and Europe.Peruvian non-musician very active in the South American experimental scene since 1995. Founder member of the independent label and association Aloardi and of bands like DiosMeHaViolado (soloist project sometimes in collaboration with Claudia Machuca, Fabian Escalante, Yuri Gutierrez and Aldo Castillejos), Evamuss (as soloist), Azucena Kantrix (with Wilder Gonzales),Tica (with Fabiola Vasquez), Garrapata (with Gabriel Castillo and Rolando Apolo), Ninguna Ninfula (with Sabrina Melenotte), Miasma (with Sergio Sanchez), 50 Otages (with Mathiu Finisterre, Bernard Bruit and Julien Otavi) and others. He explorates the broken electrical appliances, homemade audiovisual instruments, controlled induction of errors in software, programming generative tools and transducing imperceptible physical phenomena for humans to an audible dimension. He is mostly interested in the exploration of the aforementioned interfaces and auto-regulated systems to apply them to create inmersive sound experiences hacking the human perception of space-time as a form of civil disobedience and social auto-reorganization. Today he lives between France and Netherlands. He continues developing his independent projects, researches and studies in the Institute of Sonology of the Royal Conservatoire and in the “Stichting Centrum” – VillaKabila at Den Haag. His work has taken him to make concerts, installations, performances, lectures and workshops in Latin America and Europe.